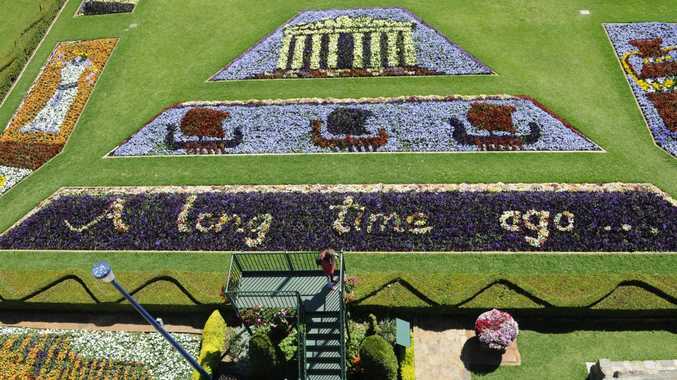 TOOWOOMBA has been transformed into a sea of colour and creativity for the 2013 Toowoomba Carnival of Flowers, which starts tomorrow. The transformation didn't happen overnight. Up to 30 council gardeners spent months planning before the hard work of planting 150,000 seedling and 9500 bulbs could even begin. But as thousands flock to Toowoomba for the Carnival, the effort was clearly worth it. Laurel Bank Park's gardens have been planted in the theme of A Long, Long Time Ago - and they are certainly out of this galaxy! The gardens are open all week and tours are available. Check out our guide to the Carnival's main events or visit the Carnival of Flowers website. Take a bow Toowoomba and get ready to party - it's Carnival time. Grand champion of Toowoomba ... and maybe the world?